A ceremony was held today at the Airbus (Tianjin) site to celebrate the 200th A320 Family aircraft assembled by the Airbus Tianjin Final Assembly Line (FALC). Daniel Baubil, Airbus Executive Vice President and Head of Single Aisle Family Programme handed over the A319, a member of the A320 Family, to China Eastern Airlines. Officials from China and Europe, representatives of China Eastern Airlines, Airbus and its Chinese partners, Tianjin Free Trade Zone (TJFTZ) and Aviation Industry Corporation of China (AVIC), as well as employees of the FALC and Airbus Tianjin Delivery Centre (ATDC), were in attendance. China Eastern is one of the largest airlines in China and was the first Chinese airline to operate Airbus aircraft (A310) in 1985. 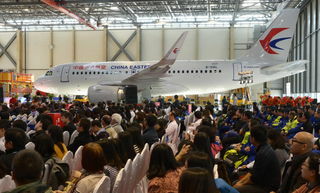 Today, China Eastern Airlines operates a fleet of more than 270 Airbus Single Aisle and Wide-Body aircraft. In March 2014, Airbus, TJFTZ and AVIC agreed to extend the successful Joint Venture for another 10 years, from 2016 to 2025. The extension, called “Phase II”, will include the final assembly of the A320neo Family from 2017 onwards for delivery to the Asian region. FALC, inaugurated in 2008, is a joint venture between Airbus, the TJFTZ and AVIC. It is the third A320 Family final assembly line in the world after the FALs in Toulouse, France and Hamburg, Germany and the first outside Europe. The ATDC delivered the first aircraft assembled in FALC to Sichuan Airlines in June 2009. Airbus is the leading aircraft manufacturer with the most modern and comprehensive family of airliners on the market, ranging in capacity from 100 to more than 500 seats. Over 14,600 Airbus aircraft have been sold to more than 470 customers and operators worldwide, and more than 8,700 of these have been delivered since the company first entered the market in the early seventies. Shortly after the delivery of the first aircraft to the country, Airbus started industrial cooperation with China. Today, some 1,100 Airbus aircraft are being operated by Chinese airlines, accounting for some 50% of the total fleet of aircraft over 100 seats in China. Chinese aviation industry companies have been fully involved in the design and assembly of Airbus aircraft. There are components produced in China on all Airbus commercial aircraft types. Airbus now has four joint ventures with Chinese partners covering training and support, engineering, final assembly and composite manufacturing, in addition to a number of cooperation projects. The A320 Family is the world’s best-selling single aisle product line with more than 11,000 orders to date and over 6,200 aircraft delivered. Thanks to its wide cabin, all members of the A320 Family offer the industry’s best level of comfort in all classes and Airbus’ 18” wide seats in economy as standard. To date, more than 900 Airbus A320 Family aircraft are in service in China with 16 operators.